This year, the courtroom became the classroom for a group of local fifth-grade students. Circuit Court Judge Daina Vitolins invited Crooked River Elementary students to the Crook County Courthouse Friday afternoon as part of Constitution in the Classroom, an annual nationwide program where lawyers and law students are encouraged to teach lessons based on the U.S. Constitution to elementary, middle, or high schools. The American Constitution Society encourages exploration of timely and important topics such as U.S. Supreme Court nominations, the rule of law, progressive federalism and the role of state courts and the state attorney general as well as voting rights or constitution interpretation. In recent years, Vitolins and other local attorneys have spent the day presenting constitutional lessons in classrooms throughout the Crook County School District and providing them with blue, handheld copies of the document to take home. This year, the students left the school to spend the afternoon at the courthouse, where they were asked to act out different roles in the criminal justice system while learning about the constitution. "I thought it would be great for the kids to see the courthouse/courtroom," Vitolins said. More than 100 eager kids packed the courtroom Friday afternoon as Vitolins took time to explain its different parts — the bar, the well and the bench. She talked about when the Constitution was signed on Sept. 17, 1787, and later went on to question students on the different branches of government. To help illustrate how the Constitution protects personal freedoms, Vitolins asked how many of the kids were Oregon State Beavers fans. Numerous hands shot up as Vitolins, an Oregon Ducks fan, feigned disgust. "What if I went to the Legislature and had them make a law that Beavers fans had to leave the state of Oregon?" she asked. "Would there be something wrong with that?" The kids, of course, were quick to agree that the law would be wrong, giving Vitolins a chance to discuss laws that violate the Constitution and how the document protects their freedoms. That discussion segued into a lesson on the Bill of Rights, where Vitolins focused on the First Amendment and freedom of speech as well as the Fourth Amendment, which protects against unreasonable search and seizure. 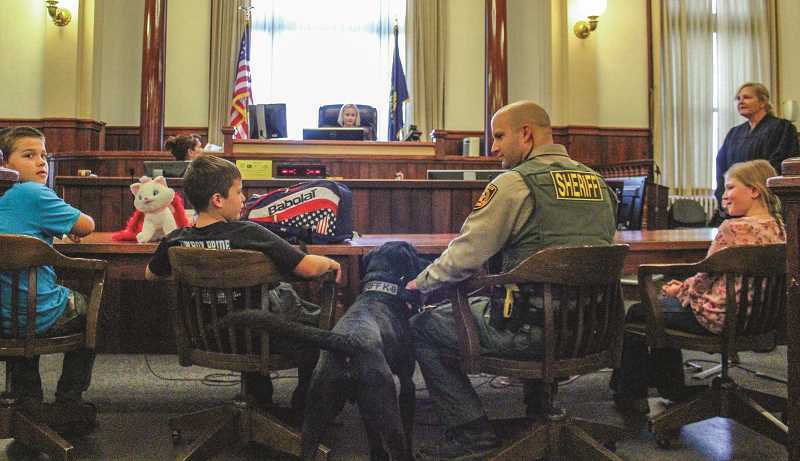 To demonstrate the Fourth Amendment and the court's role in protecting that right, Crook County Deputy Mitch Madden and his drug detection dog, Jett, participated in a skit where he conducted a search of a backpack that belonged to a student. Supposedly, the student had swiped some donuts and had hidden them in the backpack. Madden conducted the mock search without following basic laws associated with legal searches, finding the missing donuts after which Vitolins explained search laws. She also touched on the Fifth Amendment, which protects against self-incrimination, and where the reading of Miranda Rights during an arrest originated. With the donut thief suspect accused, Vitolins asked for volunteers to play the roles of judge and prosecution and defense attorneys. The volunteers then conducted a mock trial in which the accused donut thief was found innocent. "I love participating in Constitution in the Classroom. The students are smart and eager to learn," Vitolins said. "They are interested in our government and how it works. It is important that kids learn about their rights and responsibilities as citizens of our great country."